Remember the patchwork class I do at the Knitting Room? 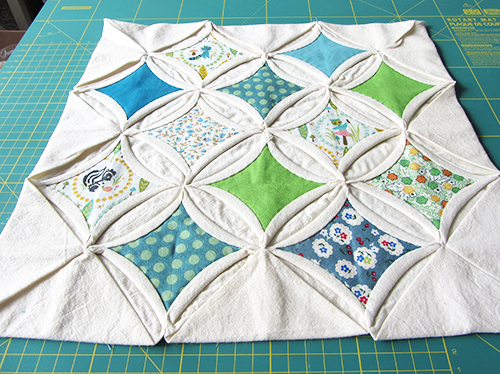 I got really hooked by the cathedral window block so it seems I have started yet an other pillow cover! The patchwork is done, I now have to figure out how to turn this into a pillow cover. I will probably have to mount the block on a larger piece of fabric wide enough to allow for seams. There is still something I am not sure of though: what should I do with the left triangles? Just open them and sew the border or add a triangle of fabric too?